Dead Flowers Productions: Get Low Down! Guitar Lightnin' Lee, a multi-talented rhythm&blues purist, has defied all rational logic by assembling his band with a bunch of veteran rock'n'rollers half his age. His talent, lyrics, powerful voice, and boisterous personality match perfectly with his backup band. Thus, creating a supercharged blown out style of New Orleans rock'n'roll and blues. The youthful exuberance from all members, especially Lightnin’, keeps the music exciting and gives it the vibrancy it had in it’s heyday. Raised in the Lower Ninth Ward in New Orleans over 60 years ago, Lightnin’ had music all around him. After learning from New Orleans blues great Boogie Bill Webb, Lightnin’ went to Chicago to find his inspiration Jimmy Reed. When Jimmy Reed wasn’t throwing Lightnin’ out of his house and telling Lightnin’ to go back to New Orleans, he was showing Lightnin’ his style of Delta Blues via electrified Chicago. 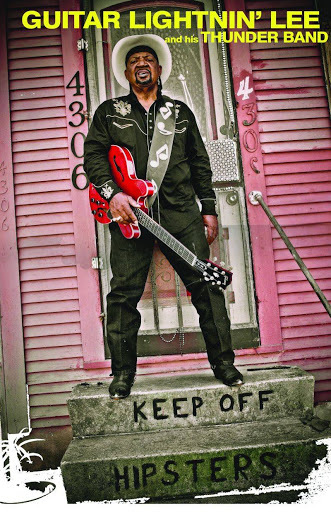 After moving back to New Orleans, Lightnin’ played with and around such New Orleans legends as Earl King, Fats Domino, Ernie K-Doe, Little Freddie King, and scores of other brilliant New Orleans musicians. Lightnin’s ears were wide open to the sound around him and he soaked it up like a sponge. For years he listened, learned, and honed his playing and song writing skills in the best of company. In 1997, Lightnin’ found a young drummer, Paul Artigues (Die Rotzz). They played together for years working on their sound. With the addition of slideman Ted Mathews and bassist Marvin Hirsch they formed the Thunder Band. Guitar Lightnin’ has released two 7-inch records on die Slaughterhaus Records and a self-released CD.